Frontiers in NanoScience and NanoTechnology is an international journal for publication of research advances at nanoscale. It publishes full length research articles, review articles and short communications. Nano Frontier is an international journal for publication of frontier research in nanoscience and nanotechnology. The journal cover all research advances at nanoscale. The journal publishes short communications, research articles and review articles. It also publish NanoSight, a novel featured short articles covering a specific area of nanoscience research. NanoScience Communications publishes research advances in Nanoscience and Nanotechnology. 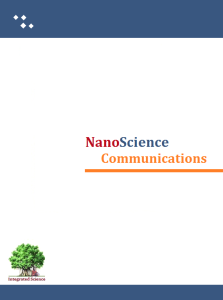 NanoScience Communications is an international journal for publication of peer-reviewed research articles on all aspects of nanoscale science, engineering and technology dealing with chemistry of materials, materials synthesis, nano processing, nanofabrication, nanoprobes, spectroscopic characterization, properties and applications of functional materials and devices. The journal provides a rapid forum to publish advanced research from nanoscience and nanotechnology. It publishes original research articles, short communications, review articles and nano-sights. Nanosights are novel short articles that brief about the advances on specific topic from nanoscience and nanotechnology. Research scholars (particularly Ph.D. students are encouraged to publish nanosight articles).